Last week we looked at living wills and their effects on estate planning for incapacity as demonstrated in the movie The Descendants. But a living will by itself is usually poor planning. No matter how elegantly drafted, it is impossible to use a living will to address every particular medical decision that may arise prospectively. So to ensure that medical decisions can be made for someone who is incapacitated in those areas where a living will is silent, estate planning attorneys advise that clients also execute health care powers of attorney, sometimes called health care proxies. 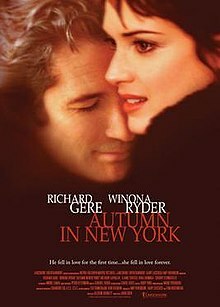 Now I’d pick George Clooney for a leading role almost every day, but occasionally you need to cast a suave lawyer or successful business executive for a 90s romantic comedy, so you go with Richard Gere. In Autumn in New York he plays Will, the boyfriend (in an all-too serious, not very good but hang with me for the sake of this illustration romantic drama) to Winona Ryder’s character, Charlotte. Charlotte has a life-threatening condition, and at the beginning of the movie she has a living will that instructs that no heroic measures are to be taken to save her life if she becomes incapacitated. But later (after falling in love with Will) she decides that she wants the doctors to do whatever Will wants. She signs a legal document, and a few scenes later Will is the person that speaks with her doctor when she is unable to speak for herself. While not expressly stated, what Charlotte signed could only have been a health care power attorney—essentially a legally enforceable delegation of authority to make medical decisions to another person (called a “health care agent”) during any period of incapacity. Where a living will directs that certain actions be taken by health care professionals (and any other interested persons) when caring for the individual, a health care power of attorney requires that the professionals follow the directions given to them by another on behalf of the incapacitated person. It “fills in the gaps” left by a living will by granting authority over any other medical decisions to the chosen agent. And if the person has no living will, it gives all medical decision-making authority to the health care agent during incapacity. This is essentially what Charlotte did in the movie—she removed the living will from her estate plan and replaced it with a health care power of attorney, and that then gave Will the authority to make all medical decisions for her during incapacity, both with regard to attempting life-saving measures and with regard to anything else that might have come up. Virginia has recognized the legal authority of health care powers of attorney for over twenty years, but in 2009 Virginia broadened its laws to specifically allow health care powers of attorney to address new subjects, including visitation rights, hospitalization for mental health treatment, and enrollment in health care studies. Virginia health care powers of attorney drafted prior to 2009 typically do not mention any of these concerns, and can be significantly improved by an update of them. We talk about these Virginia-specific nuances in more detail at our regular seminars, which you are welcome to attend when we are in your area; you are also welcome to come ask your questions about how these health care powers of attorney are used practically in health care settings day to day, which is sometimes surprising. We’ll conclude this short series on estate planning for health care during incapacity with a post next week on organ donation and advance medical directives. Stay tuned.